This is a Two Person Team WOD: While Partner 1 does the WOD above, partner 2 will run 400 meters with a sandbag or plate (45/25.) Upon Partner 2’s return Partner 1 will grab the load and run, while Partner 2 continues work wherever Partner 1 left off. Score = Total reps.
Jackson ‘One Lung” Robinson, post WOD collapse. Today’s workout, although a team workout, is our way of honoring the 31 Heroes fundraiser that took place at CrossFit boxes worldwide last Saturday. Many Spec Ops forces in training and operations place a premium on unit integrity and team work, down to the 2 man team. I have read that punishment is administered in training to any guys who are found further than arms length from their teammates. 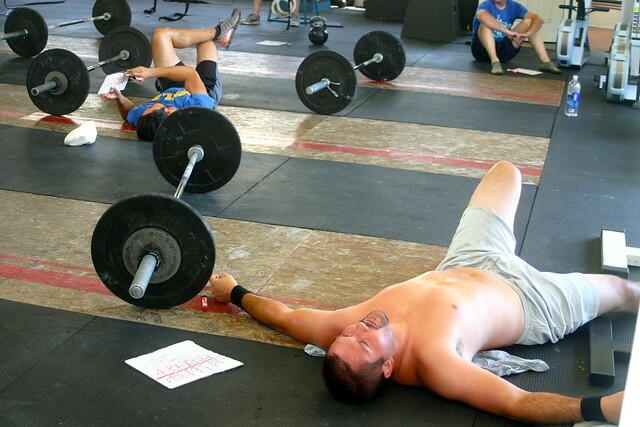 This WOD is to reinforce the idea of feeding off your partners intensity. As always, do not worry about doing this at prescription loads or heights; scale to your abilities. Due to the length of the workout, we will be assigning partners and running heats as needed!